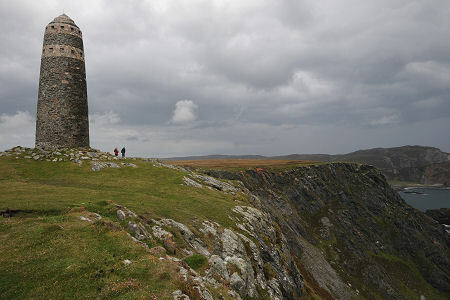 The rocky peninsula which forms the south western part of Islay is known as The Oa. In the mid 1800s it was home to a significant population, but this diminished dramatically through the rest of the century through clearance and emigration, and today it forms a remote and little populated appendage to the island. 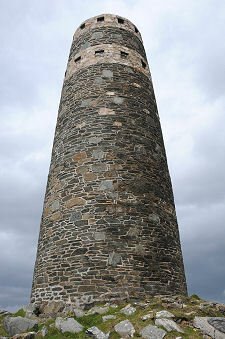 The Oa is reached from Port Ellen by a minor single track road which passes through the remaining buildings of Port Ellen Distillery and goes round the head of Kilnaughton Bay before climbing into the interior of the peninsula. The road continues past the tiny settlements of Cragabus, Coillabus and Risabus for some five miles before coming to an end in a small car park. The car park serves the RSPB's Oa Nature Reserve, and the birdlife on view in the surrounding reserve include seabirds like fulmars, kittiwakes and razorbills making the most of the available nest sites in the spectacular cliffs which define the limits of the peninsula. Other avian residents include corncrakes and golden eagles. Many people come here for another reason, however. A well marked path, boggy in places after rain, extends for 0.8 miles from the car park to the American Monument. This circular tower stands some 10m in height and occupies a location close to the edge of cliffs that drop for 300ft to the sea below. The stones it is made of have an interesting colour and arrangement and the shape of the monument gives the impression of a windmill that has been shorn of its sails. 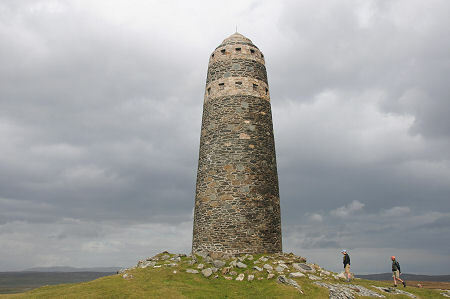 The American Monument is a memorial to the hundreds of American servicemen who were killed when two troop ships were lost off Islay in 1918. It was erected by the American National Red Cross in 1920 and carries a large plaque looking almost like a doorway commemorating the two sinkings, surmounted by an eagle carrying a wreath. A smaller bronze wreath set in a plinth near the foot of the monument is a tribute from President Woodrow Wilson. The epitaph on the main plaque is very moving: "On Fame's Eternal camping ground, Their silent tents are spread, While Glory keeps with solemn round, The bivouac of the dead." The S.S. Tuscania was a troop ship en route from New Jersey to Britain with some 2,000 US soldiers on board when, on 5 February 1918, she was torpedoed by the German U-boat UB77 commanded by Captain Wilhelm Meyer some seven miles off the Mull of Oa. She sank some hours later, and 200 US servicemen plus 60 members of her British crew (sources differ as to exact numbers) lost their lives during her abandonment or when lifeboats were subsequently wrecked on the rocks of The Oa. Just over eight months later, on 6 October 1918 a second ship heavily laden with US servicemen, H.M.S. Otranto, sank in Machir Bay off north western Islay after a collision in fog with another troop ship, H.M.S. Kashmir. This time 431 lives were lost: 80 members of the British crew and 351 US servicemen. 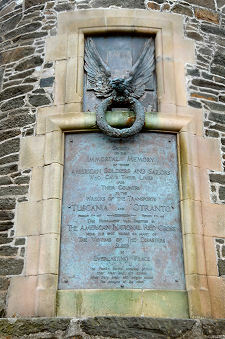 The US victims were buried, along with 73 of the British crew, in a military cemetery established at Kilchoman, overlooking the site of the tragedy, before being repatriated in 1920. Kilchoman Military Cemetery remains the last resting place of the British crew members who were buried there. The losses of the S.S. Tuscania and H.M.S. Otranto had considerably more impact in the USA than they did in Britain, where four years of industrial scale war set even this many deaths in grisly perspective. In the USA, however, the sinking of the Tuscania resulted in the first large scale military loss of life since the American Civil War, and the even larger losses caused by the sinking of the Otranto seemed especially poignant, coming as they did so close to the end of the war. 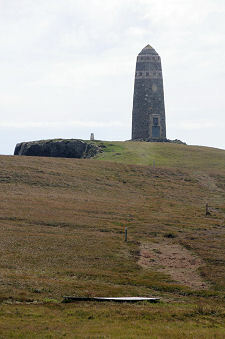 The American Monument's prominent position means it can be seen in distant views of The Oa from north west Islay, and it serves as one of a number of reminders of the double tragedy in 1918. Another is the Kilchoman Military Cemetery, while the ship's bell of the S.S. Tuscania is on view in the Museum of Islay Life in Port Charlotte, from which the memorial can be see.